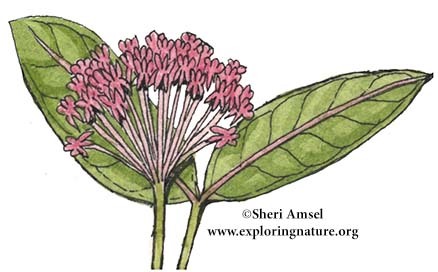 They have small, pink, sweet-smelling flowers in thick bunches (clusters) on top of the plant. The flowers grow into bumpy, green pods. In the fall, the pods burst open and downy seeds fly away. The large leaves are woolly underneath, like the stems. Broken stems leak sticky, white juice. They bloom June through August.